Sunday night on a long weekend feels good :) I'm sure others agree with me. 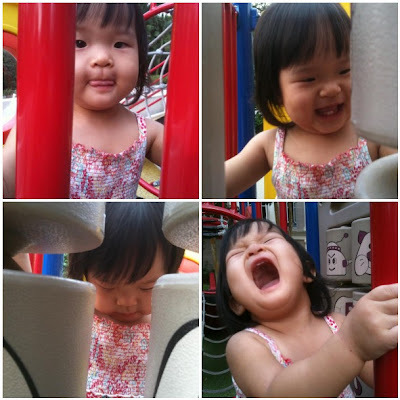 This is Bubbles thoroughly having fun at the playground. She loves to spin these cylindrical things that have different pictures on them. I unconsciously yawned once. She gave me a cheeky look, threw her head back, opened her mouth as WIDE as possible, and did a loud Aaahhhhoon. This was followed by a burst of baby chuckles. She was pleased as punch with her yawn imitation. And I was pleased as punch that my iPhone's camera did not fail me. A mischievious streak is most certainly starting to show! nicely captured! such a sweet girl! Thank you :) I'm glad the camera didn't fail me!